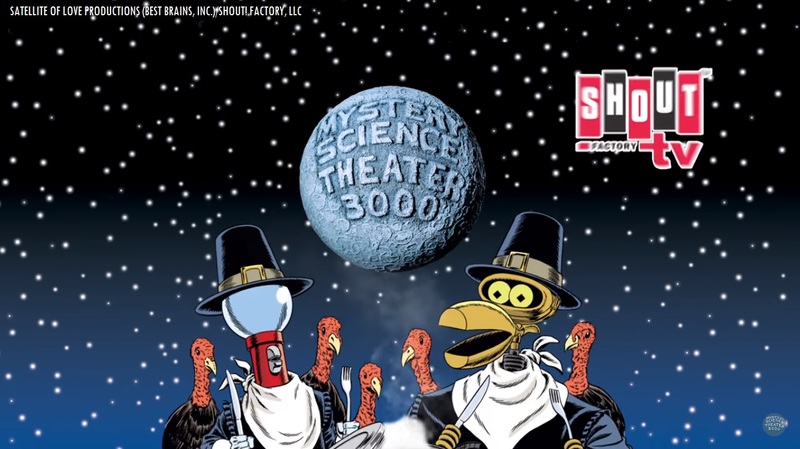 MST3K “Turkey Day” infographic from Shout! Factory TV! Fellow Svengoolie SvenPals throughout the land will be looking forward to an iconic 1957 sci-fi thriller feature from Universal Studios. 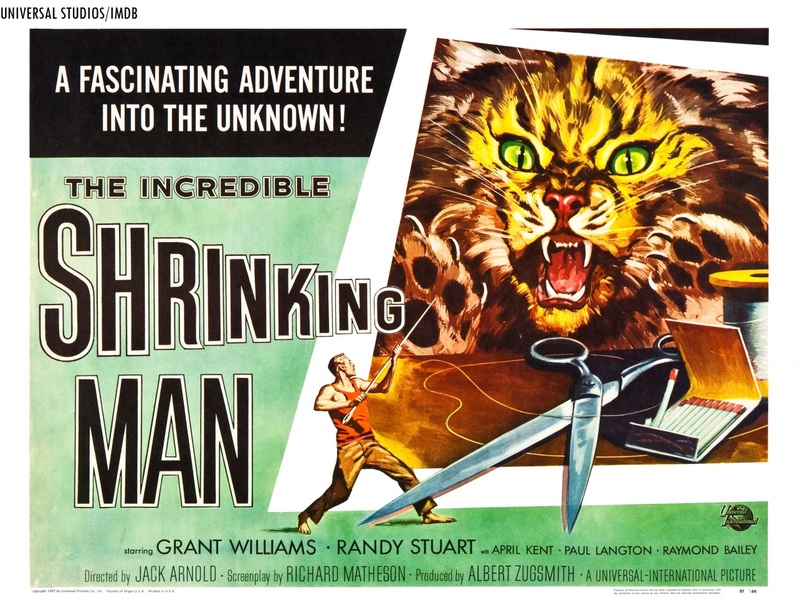 The iconic Chicago/Berwyn-based horror film host will showcase “The Incredible Shrinking Man” (1957), this Sat., Nov. 25 at 8 p.m. Eastern/7 p.m. Central on Me-TV. “The Incredible Shrinking Man” was directed by veteran Universal Studios film director Jack Arnold, who was also known for his work on “It Came from Outer Space” (1953), “Creature from the Black Lagoon” (1954) and “Tarantula” (1955). The screenplay was adapted from Richard Matheson’s 1956 science fiction novel, “The Shrinking Man” (according to IMDB, Matheson also wrote the screenplay for Arnold’s film). This will mark Sven’s fourth showing of Jack Arnold’s 1957 Universal Studios sci-fi feature on Me-TV. He had previously shown “The Incredible Shrinking Man” back in May 2011, Oct. 2014 and May 2016.
Who was in “The Incredible Shrinking Man” (1957)? The players who appeared in Arnold’s 1957 film were Grant Williams (as Scott Carey), Randy Stuart (Louise Carey), April Kent (as Clarice), Paul Langton (as Charlie Carey), Raymond Bailey (as Dr. Thomas Silver), William Schallert (as Dr. Arthur Bramson), Billy Curtis (as a little person), Frank J. Scannell (as a Barker), Diana Darrin (as a Nurse), Helene Marshall (as a Nurse) and Orangey the cat (in an uncredited role as Butch the cat). A fun, lively, entertaining and hilarious afternoon of silver screen riffs were enjoyed by many fellow MSTies in the Frederick area! 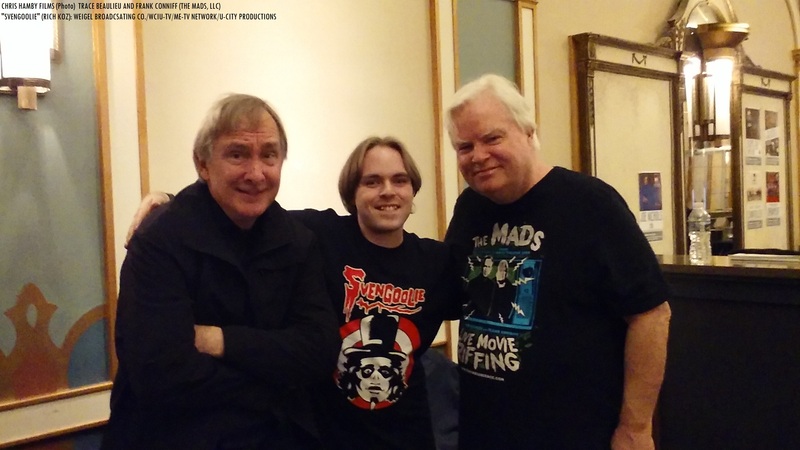 Trace Beaulieu and Frank Conniff’s “The Mads Are Back!” at the Weinberg Center for the Arts! On the afternoon of Sat., Nov. 18 at the Weinberg Center for the Arts in Frederick, Maryland; I got to experience Trace Beaulieu and Frank Conniff’s live movie riffing touring show, “The Mads Are Back!” The legendary “Mystery Science Theater 3000” alums’ Frederick performance was their 100th touring appearance. Fellow MSTies of “Mystery Science Theater 3000” from coast-to-coast will be excited about the return of a Thanksgiving day tradition! Shout! 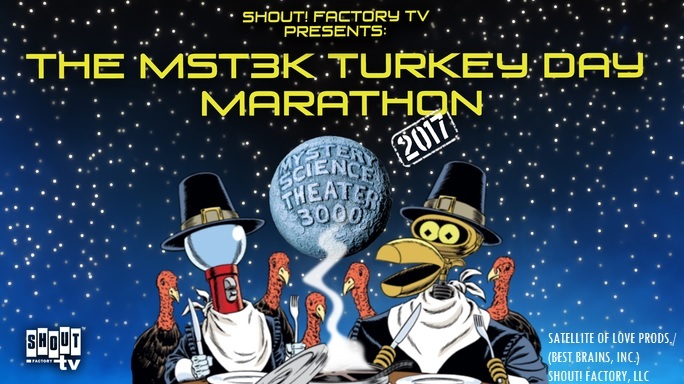 Factory TV will present the “MST3K Turkey Day Marathon 2017” on Thu., Nov. 23 (Thanksgiving day) at Noon ET/11 a.m. CT/10 a.m. MT/9 a.m. PT on shoutfactorytv.com. Shout! Factory TV is also available on Roku, Amazon Fire and Samsung Smart TV platforms. Shout! Factory TV’s streaming service is also simulcast on Pluto TV (Channel 512) and on the Twitch service. Fellow Svengoolie SvenPals from coast-to-coast will be jumping for joy this Sat. as he will present one of the definitive Universal Studios cinematic monster comedies! The legendary Berwyn/Chicago-based horror film host will showcase “Abbott and Costello Meet Frankenstein” (1948) this Sat., Nov. 18 at 8 p.m. ET/7 p.m. CT on Me-TV. The 1948 Abbott and Costello comedic cross-over with the Universal Monsters was directed by Charles T. Barton. This was Barton’s fifth feature with the iconic comedy duo; he had directed the “The Time of their Lives” (1946), “Buck Privates Come Home” (1947), “The Wistful Widow of Wagon Gap” (1947, w/ Marjorie Main) and “The Noose Hangs High” (1948). This will mark Sven’s sixth showing of “Abbott and Costello Meet Frankenstein” on Me-TV. He had previously shown the popular Universal monster farce back in Oct. 2011, Nov. 2013, Oct. 2014, April 2015 and Oct. 2016. The players who appeared in Barton’s Universal monster comedy were Bud Abbott (as Chick Young), Lou Costello (as Wilbur Grey), Glenn Strange (as Frankenstein’s monster), Bela Lugosi (as Count Dracula), Lon Chaney, Jr. (as Lawrence “Larry” Talbot/the “Wolf Man”), Lenore Aubert (as Dr. Sandra Moray), Jane Randolph (as Joan Raymond), Frank Ferguson (as Mr. McDougal), Charles Bradstreet (as Dr. Stevens) and an uncredited voice-over cameo by a young Vincent Price (as a “monster” who makes a surprise appearance)*. 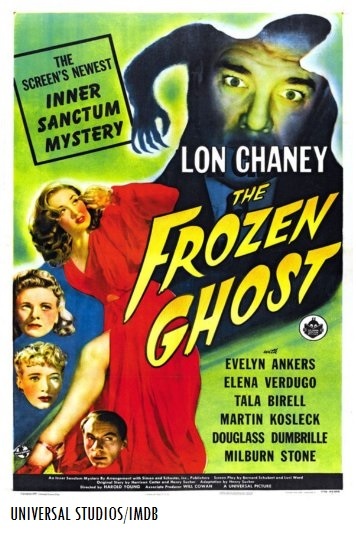 This would mark Glenn Strange’s third cinematic appearance as Frankenstein’s monster. He had previously played the role of Frankenstein’s monster in “House of Frankenstein” (1944) and “House of Dracula” (1945). This would be the second and final time that Bela Lugosi would portray the role of Count Dracula on the silver screen (according to IMDB). 1944 Warner Bros. publicity ad for “Hollywood Canteen,” with a statement by film personality Bette Davis (who was also the president and co-founder of the canteen). The film was based off of the real Hollywood Canteen, which was located on Cahuenga Boulevard in Los Angeles, California. According to Frank Miller’s Turner Classic Movies article on the film, the original canteen was the brainchild of John Garfield, who felt that there was nothing for members of the Armed Forces that were stationed in Hollywood. Inspired by the American Theater Wing’s “Stage Door Canteen” in New York City, Garfield, along with Davis, numerous players and financial/fundraising backing from MCA founder/agent Jules Stein, the Hollywood Canteen was established. 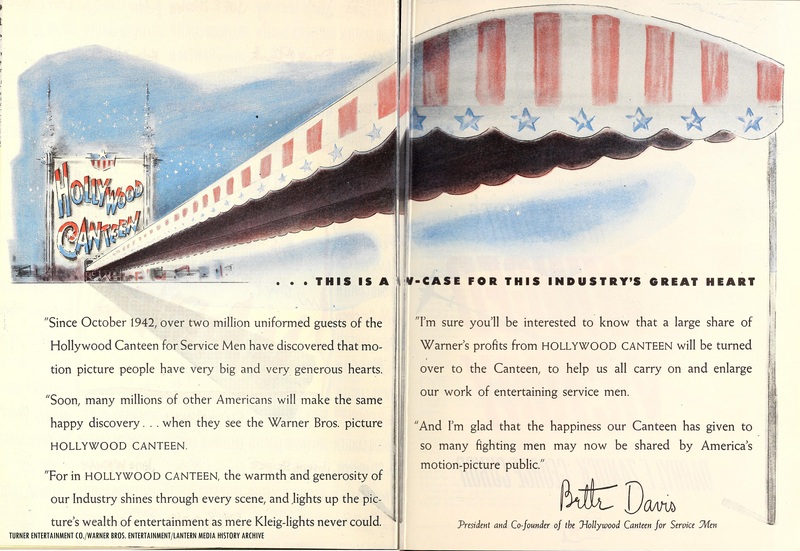 Forty percent of the profits that were made from the “Hollywood Canteen” film were donated to the actual canteen, according to additional details from Miller’s TCM article. The writer of “Silver Screen Reflections” salutes all veterans of the Armed Forces. Thank you to all of our brave servicepeople everywhere! -C.H.